"Exactly! It is absurd — improbable — it cannot be. So I myself have said. And yet, my friend, there it is! one cannot escape from the facts." - Hercule Poirot (Murder on the Orient Express, 1934). If there's one thing we have enough of here, it's water. We have so much of the stuff that we could drown in it. Literarily! To prevent this from happening, a campaign was waged against the rising water by engineering and building dikes to provide a sturdy resistance against the pounding waves of a brimming ocean, but our arsenal also includes levees, canals, estuaries and nature reserves – giving the water the space it needs to flow and drain away without washing away half of the country. One of these spots is De Blauwe Kamer (The Blue Room), a riverside reserve, affixed to the Utrechtse Heuvelrug (Utrecht Hill Ridge), which also happens to be the natural habitat and hunting ground of the furrowed-faced Inspector Petersen, where he, and his colleagues, have to roam the slopes and hills after a scavenger of a different breed left a body in the waters of the reserve. De dood van Callista de Vries (The Death of Callista de Vries, 2012) is the sixth full-length novel in the District Heuvelrug series and begins when a diving team probe the waters of The Blue Room for unexploded ammunition from World War II, but what they drag up is a ripped sack containing the bloated and gnawed body of a woman – weighted down with heavy boulders. Murder, plain and simple, which is not something that can be said of the circumstances in which the crime was discovered as it conflicts with the statements given by the silent witnesses. The body was wrapped up and weighted down, indicating that the murderer wanted to delay the discovery as long as possible, allowing the murky waters and animals to erode the evidence, but, why then, dump the body in a place where it was bound to be discovered? It was widely publicized that the area would be cleared for leftover ammunition from the war and the path to the scene of the crime took the murderer pass a house and three house boats! A considerable and unnecessary risk when you consider that the region was fertile with watery graves where a body could sink into Leth. Usually, these cases are solved once the police learns the name their John or Jane Doe listened to in their daily lives, but this is a detective story and the victim turns out to have been somewhat of a cherchez la femme named Callista de Vries – a beautiful young woman from Utrecht who was reported missing two days previously. Callista openly broke off her relationship with Iwan van Schijndel, who declares that they were back together, but he had to promise her to keep everything under wraps for a while and this secrecy may overlap with her having moved around in the criminal layers of society. Even more baffling is that Iwan van Schijndel was one of the divers who found the body! There you have it, just a few of the winding pathways leading through the maze that Petersen has to navigate his team through. 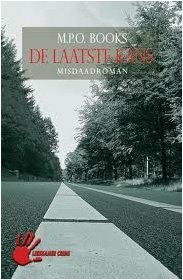 Last year, I wrote a laudatory review of Marco Books' De laatste kans (The Last Chance, 2011), which I praises as a "lavishly plotted detective story" and the clueing and misdirection was straight out of a classic detective story. One clue in particular was an absolute gem! Ever since finding a home at his new publisher, De Leeskamer (The Reading Room), he has been improving leaps and bounds as a writer, finding a better balance between plot and character with each passing book, and has become much more comfortable with the form. In a recent YouTube video, Books explained the difference between "lazy police novels" and whodunits. You can read one without having to burden your brain, sit back and let the words of the author lead you to solution, while the latter gives you a fair shot at beating the detective to the solution. That is, if you are clever and observant enough. Books gave this format a modern interpretation similar to a number of post-GAD writers discussed on the blog. Over the course of these books, the reader has learned almost as much about the policemen who investigate crimes as the crimes they investigate and snippets of their personal lives show them to be more than a mere collection of theatrical puppets, dressed up as Sherlock Holmes and Dr. Watson, waiting in the wings to thwart the killer in the final act. And this without dumbing down the plot. 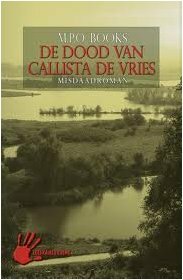 The plot of De dood van Callista de Vries is also scattered with clues, but they were a trifle weaker and missed the brilliant radiance of the ones that were tucked away between the covers of the previous book, however, they were still there and that made for stimulating read. Books has pulled off a hat trick with this book, delivering three engagingly written, well-paced and deftly plotted detective stories in the same number of years, and the well of ideas he draws from seems to be far from being dried up.